Shabtabnews – While the executive decrees of prisons insist that the location of prisoners should be proportionate to their crime, hundreds of Gonabadi Sufis, even though their verdict has not been finalised, have been imprisoned for more than seven months amongst hard line criminals, drug traffickers and violent offenders and are thus forced to spend their days in jail under the worst circumstances. The Sufi prisoners are often forced to sleep in front of the toilet seats, while keeping close eye on personal belongings, at the risk of catching contagious diseases, and facing threats and extortion by violent prisoners. These are only some of the problems faced by Sufi who have been arrested and transported illegally to prisoners. Furthermore, 19 Gonabadi Sufis who are in hunger strike in protest of the harsh treatment and beatings their fellow Sufi prisoners received last month at the hands of prison authorities of the Fashafiyeh prison, have also been abandoned in the hands of dangerous prisoners, and as a result the only place where they can afford to sleep is the dirty toilets infected with contagious diseases. More than 300 Gonabadi Sufis who were arrested after the 7th Golestan incident in February, have been sentenced to nearly two thousand years in imprisonment in the absence of any form of legal representation. 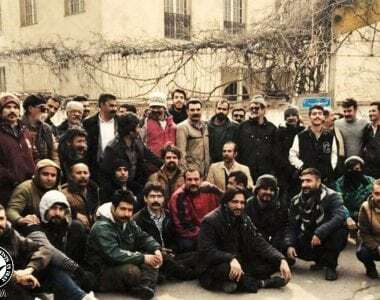 These Sufi prisoners are now serving their sentences in the prisons of Fashafiyeh, all the while the country’s legal community, and lawyers fail to show the slightest reaction towards the illegal and inhuman conditions imposed on the Sufis by the prison authorities.